Ocean Prime, Denver Tech Center — Denv.Her. denv.her. was invited in for dinner at the new Ocean Prime in the Denver Tech Center and we were ecstatic to review this seafood and steak hot spot (one of my favorite restaurants in CO)! This was my sister's first time dining at OP and I couldn't wait to show her what all the buzz is about. The DTC location is the second Ocean Prime in Colorado - I used to frequent OP's location in downtown Denver at Larimer Square but the new DTC location has become my new spot! 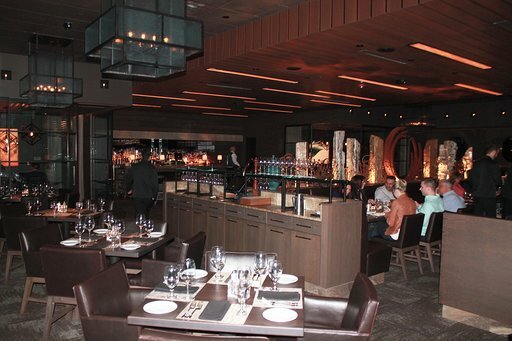 Ocean Prime DTC is located off of Belleview and Ulster - in the heart of the Denver Tech Center. Ocean Prime DTC is the largest OP location to date. The location has a large bar area, fantastic patio, a beautiful dining room, and multiple private dining rooms. This location boasts the largest Private Dining room OP has ever had, with dinner seating for 80 and 200 for cocktail hour. The aesthetic of OP DTC is sleek and modern - dark woods and black iron light fixtures grace the dining area. There is a variety of seating types ranging from large booths to smaller intimate tables. The wine wall upon entrance is grand and a serious visual statement to the wine selection available at OP. 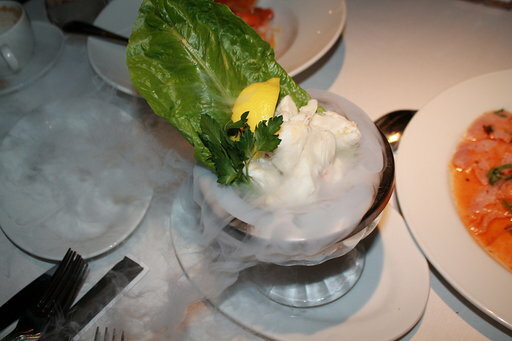 You can always expect stellar service when dining at Ocean Prime & the DTC location is no different. Every member of the OP staff we met at dinner had been with the company for 4+ years - that kind of tenure in the restaurant industry speaks volumes of how Ocean Prime takes care of their staff - which then motivates the staff to take care of the customers. Our waiter, Dan Matthews, was incredible and knew the menu inside and out. He also had some jokes up his sleeve that kept us entertained and laughing throughout the night! You'll always start your meal at OP with a hot bread basket - the pretzel bread is #amaze. After browsing the appetizer selection and getting recommendations from Dan, we settled on three starters. 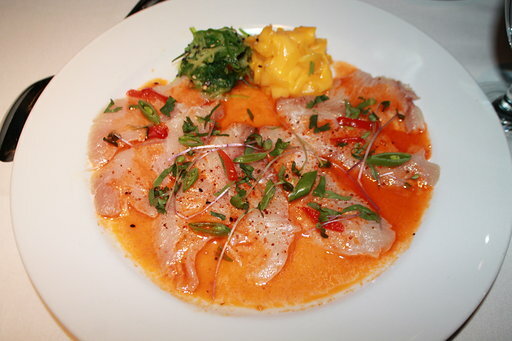 The HAMACHI CRUDO with Pickled Mango, Sweet Peppers, Cilantro, Sesame Ginger Vinaigrette is plated beautifully and has an absolutely stunning color variation. 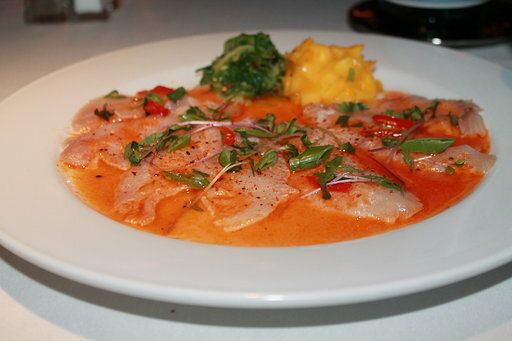 The hamachi is garnished with pickled mango, sweet peppers, cilantro, and a delectable sesame ginger vinaigrette. This dish is a sushi lover's dream. 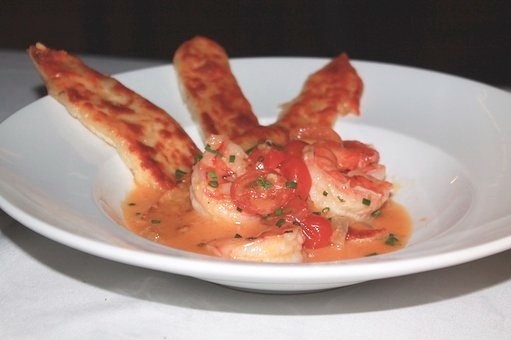 The SHRIMP SAUTÉ with Tabasco Cream Sauce comes with four large shrimp in a Tabasco cream sauce with three pieces of fried Gruyere cheese #drool. The Tabasco adds the perfect Cajun style to this dish without coming off overly spicy - the Gruyere's salty and slightly earthy taste pair nicely with the kick of the Tabasco and succulent shrimps. 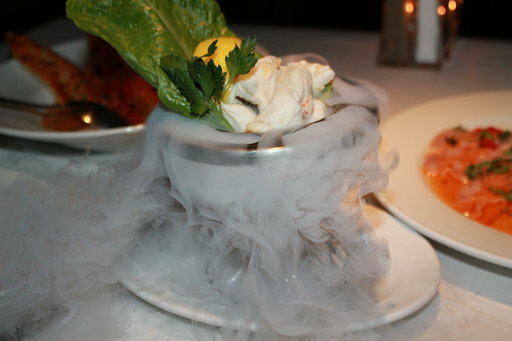 For cocktails, you can’t dine at any Ocean Prime location without ordering a Berries & Bubbles - this is OP's most photographed item across the country. BERRIES & BUBBLES made with Belvedere Citrus Vodka, Marinated Blackberries, House Made Sour, Domaine Chandon Brut, and Dry Ice Smoke is a fruity goddess of a cocktail and has the looks to match. Dining Room Manager, John Whitmer as well as General Manager, Aaron Wesley came and introduced themselves and were absolutely lovely. Both exuded great passion for Ocean Prime and the new DTC location which was wonderful to see. Dan suggested the Florida Grouper & I'm SO glad he did - I had never had this entree before and I will definitely be ordering it again. The FLORIDA GROUPER with Lobster, Gnocchi, Spring Peas, Lemon Jus was cooked perfectly. The grouper had a light sweet taste and firm texture with nice chunky flakes. The broth, tomatoes, gnocchi, and lobster paired amazing with the fish - this dish was excellent overall. 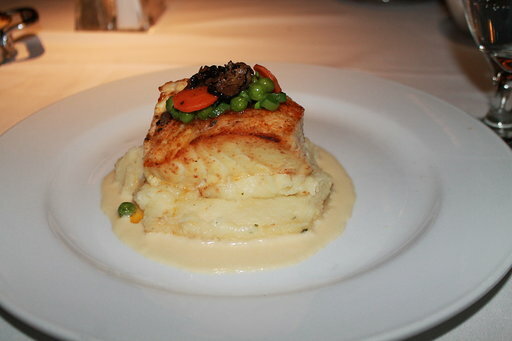 The second entrée we ordered was the classic Chilean Sea Bass. If you have never dined at OP before, you HAVE to order the Chilean Sea Bass - it's more or less a right of passage and is a true menu standout. The CHILEAN SEA BASS with Whipped Potatoes, Champagne Truffle Sauce is a thick bass filet with a light and fluffy texture that arrives atop a bed of whipped potatoes. This masterpiece is then generously coated in champagne truffle sauce #YAS - melt in your mouth truffle goodness. OP’s Chilean Sea Bass continues to be the best bass, I've ever had. For sides, you really can't go wrong with any of OP's selection - this go round we ordered the especially when one of them is the BLACK TRUFFLE MAC & CHEESE (+lobster if requested) and the ROASTED BRUSSELS SPROUTS. Sous Chef, James Newell came and introduced himself and was so sweet - he's obviously incredibly talented in the kitchen and his excitement for the food he's able to create with Ocean Prime really shown through in his conversation with us! James sent us out some desserts that I had never tried before - the Mile High Carrot Cake and the Warm Butter Cake. The MILE HIGH CARROT CAKE with Cream Cheese Icing and Pineapple Syrup is OP's most popular dessert on the menu and I cannot believe this was my first time trying it! The Carrot Cake stands tall with multiple layers of cream cheese icing and pineapple syrup drizzled on the plate. SO, SO good. The WARM BUTTER CAKE with Fresh Berries, Vanilla Ice Cream, Raspberry Sauce is fresh out of the oven and piping hot. The cake is then topped with vanilla ice cream and garnished with fresh berries and a raspberry sauce. TO DIE. This was also my first time having the butter cake and it was sinful. Pure hot, fluffy buttery cake goodness! The CRÈME BRÛLÉE and the CHOCOLATE PEANUT BUTTER PIE are also home runs when it comes to OP's desserts! Now, OP isn't just for amazing dinners readers - Ocean Prime’s Happy Hour and their Sunday Surf & Turf are even more reasons to visit! Working in the Tech Center, OP DTC is my favorite spot to bring clients and to have company happy hours - the food is always delicious, the atmosphere lively, and service impeccable. The happy hour here is unmatched as far as value and food quality. I come here often with clients and team members and it never disappoints! The menu offers $2 oysters, $10 small plates including that Lobster Mac & Cheese and another one of my favorites, the Lamb Lollipops #NOM. There is always a $10 sushi roll available and of course drink deals! You can get $10 select happy hour cocktails, $5 beers, and $8 selected wines and spirits. The Sunday Surf & Turf is a prix fixe dinner menu with options for each course for only $55 per person #DEAL. Your main course options include an 8 oz filet with your choice of shrimp scampi, crab cake, or seared sea scallops. Bonus! All bottles of wine under $99 are half off #ANOTHERDEAL. HUGE, HUGE thanks to OP DTC for hosting denv.her. for this OUTSTANDING dinner. Dan, John, Aaron, and James - thank you SO much for your hospitality and for making our meal even more exceptional than we had anticipated - we can't wait to see you all again soon! Make your reservations at OP DTC today readers - see you there and you will not be disappointed!